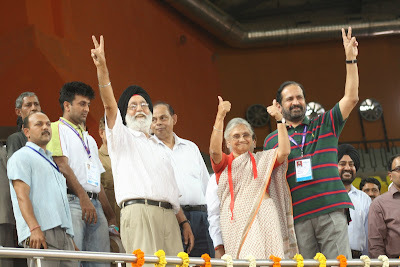 Over fifteen thousand people from around the globe will participate in the 19th Commonwealth Games scheduled to be held in New Delhi from 3 – 14 October 2010. Estimated as the most expensive and lavish, the organizing team has been under tremendous pressure since the last few months to meet the deadline. Aditya Raj Kaul interacted with the man who is going to shape this into reality – Dr. M.S. Gill, Youth Affairs and Sports Minister of India at the Inauguration of the largest Indira Gandhi Indoor Stadium at New Delhi. 1) The Commonwealth Games (CWG) 2010 in New Delhi is merely five months away from now. How prepared is the country to face this mega event after decades? Few days back we were at the Thyagraaj Stadium and that was remarkable. We have the Indira Gandhi Indoor Stadium being opened as we talk. Apart from being an air-conditioned Indoor stadium, it also has a remarkably done up roof. The seating capacity is of about fifteen to twenty thousand. The colours are vibrant. We can include all sorts of games here, like gymnastics, volleyball, basketball, wrestling and Judo. You name it and we are capable of it. People of our country will remember the infrastructure well after the Commonwealth Games are over. 2) The media and even Commonwealth Games International Committee, which came to monitor the progress, said that the authorities are running slow on constructions. Is there a challenge to meet the deadline? I hope the press has little more faith and confidence in the possibility that Indians can do it. Every other week we are inaugurating and bring forth a new stadium. And I am certain we’ll be ready in good time. I agree if things would have been different we could have achieved this much before. We should have been prepared well in advance, a year and half back perhaps. But we’ll be ready now. I am satisfied that the work is going smoothly, and there are no technical difficulties being faced. Jawahar Lal Nehru Stadium which will host both the opening and closing ceremonies of Commonwealth Games will be ready by June. Of course, there are challenges. We have a great facility, but important is to look after it, to make sure it looks same as it does today, not just for 15 days of the Commonwealth Games but forever. These are things we have to think about. But if India can build this, they can also think and work out. 3) It is estimated that the upcoming CWG is the most expensive ever after the last CWG at Melbourne in 2006. What is the total budget and are we going to see world class facilities which are going to permanently shape up the city for good? What kind of facilities would these be? US$ 1.6 billion is to be the total budget estimated for hosting the 19th Commonwealth. Security is a big concern for us. We have spent Rs.350 crores on CCTV Cameras that will be installed all across the city. We do not want to leave any stone unturned as far as security is concerned. The recent Hockey World cup and the Commonwealth shooting, archery and boxing championships have provided opportunities to have a test run of security. I have been personally visiting every now and then stadiums and other construction sites all over the city. I have also traveled worldwide in my lifetime. Frankly, there is nothing like this in London, Melbourne or going to be in Glasgow. I am not exaggerating. The Commonwealth Games truly have been far more modest than what Delhi is going to show. This will be proven to the world. The CWG President himself has said this more than once in the past. The Dhyaanchand hockey stadium is the world best and the shooting range has lavish facility and a background of a prominent city fort Tuglaquabad. I have even been to Beijing and went to Mexico long ago when they had the Olympics, nothing like this was there. Each of this is going to surprise the world. These are being built with much larger standard than the Commonwealth games. 4) How important are these games for India as the emphasis is most often given to Cricket? India is very confident. India is young India. Everybody knows who reads economic writings in the press that we have the largest percentage of young people in the world, barring none. Even China has less, Japan is totally aged. Europe, America and the white world is aged. This is all for the young population of India. I think young India has to come forward and look after it. 5) Everyone is expecting a grand function to celebrate the arrival of CWG in India as the Queen’s baton reaches Sydney on 19th April by the local Indian community. Any message for the Indian Community in Australia? I wholeheartedly wish them luck for the event. At the same time I ask them to be the ambassadors of our country and invite people for the opening ceremony on the 3rd of October where we’ll have an extravaganza which will be remembered for times to come.